Mix the salt and flour in a bowl. Add the cubed butter and mix with the four until the mixture resembles coarse breadcrumbs. Make a well and add a lightly beaten egg in the middle. Combine egg with the butter/flour mixture with your fingers and knead until a dough forms. Once complete, leave the dough in the mixing bowl and chill it for 15 minutes. 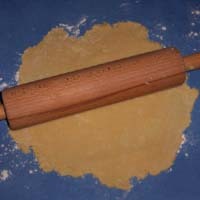 On a lightly floured surface, roll out the pastry until it is about 3 mm thick. Transfer to the pastry to a greased flan tin (23 cm diameter) or in 4 small flan tins (12 cm diameter). Press down very lightly so that the pastry follows the shape of the tin. Be careful not to rip the pastry as it is very delicate. Blind Bake for 15 minutes at 200 degrees Celsius. Once the 15 minutes are up, remove the pastry from the oven and put it aside to set. Brie Tart - A rich and creamy tart perfect as a starter or as a light meal in its own right. Quiche Lorraine - perfect when served either hot or cold with a nice side salad, it makes an ideal dish for use at a picnic or other outdoor dining occasion. Tarte Tatin - Combining the taste of caramel with the flavour of the apples cooked in butter under a golden pastry crust. Pissaladiere - A traditional French dish that balances the sweetness of caramelized onions with the saltiness of anchovies and olives.